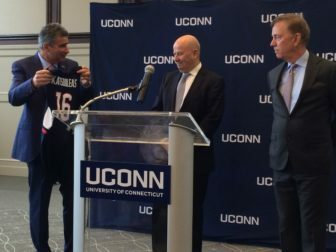 Thomas C. Katsouleas accepting UConn jersey from Thomas Kruger and Gov. Ned Lamont in February. One of Lamont’s first acts after taking office in January was to postpone selection of a new president until he became comfortable with the ability and willingness of the search committee’s choice, Thomas C. Katsouleas, to make UConn a bigger partner in economic and workforce development. With Lamont’s support, the UConn board unanimously voted on Feb. 5 to name Katsouleas as the 16th president of UConn, succeeding Susan Herbst. Katsouleas, a scientist who is the provost and executive vice president of the University of Virginia, is scheduled to take office Aug. 1. Kruger will leave the board after its next meeting on April 24. The vice chair of the board is Thomas D. Ritter, a lobbyist, former speaker of the Connecticut House, and the father of House Majority Leader Matt Ritter, D-Hartford. In an interview Monday afternoon, Drajewicz and Mounds took pains to say they now see Ritter, who was widely seen to be critical of the search for a new president, as a supporter of Katsouleas. A willingness by Ritter or anyone else to offer dissenting opinions during the search process is an attribute, not a liability, Drajewicz said. “I think there’s a real risk at this level of government to surround yourself with yes people, and there is a real value to independent thought and speakers,” Drajewicz said. Drajewicz said the departure of Kruger, an advocate of the selection of Katsouleas, is no reflection on the incoming president, but rather a desire to name his own team. Lamont has met twice with Katsouleas since his selection, talks to him regularly by phone and is looking forward to his arrival, Mounds said. “He feels even better about that decision today than he did then,” Drajewicz said. Board members are named to staggered six-year terms as trustees, and Mounds said the terms of five will soon be expiring, providing an opportunity to appoint people who agree with the governor’s vision for UConn as a player in economic development. “You’re going to see a slate of individuals that are going to be representative of that vision,” Mounds said. Gov. Dannel P. Malloy appointed Kruger, a corporate lawyer in New York City who lives in Greenwich, in 2011 and reappointed him in 2017, when he also chose him to succeed Larry McHugh as chairman. Kruger was asked recently to relinquish his chairmanship, and he declined to stay on the board for the remainder of his six-year term. Kruger confirmed that he had submitted his resignation to be effective at the close of the trustees’ April 24th meeting. Administration officials declined to discuss the decision to deny another term to Nayden, a move certain to invite accusations that the administration was willing to exile a generous philanthropist from the board over his political association with Stefanowski. Nayden, who is from Wilton, declined to comment about being told Lamont would not name him to a fourth six-year term. He was appointed to the board by Gov. John G. Rowland and reappointed by Govs. M. Jodi Rell and Dannel P. Malloy. As a GE executive, Nayden played a role in directing about $11 million in corporate contributions to UConn in 2000, shortly before Rowland named him a trustee. In addition to raising money from others, he has made personal contributions to UConn of $5 million with his wife, Britta. He was co-chair of Campaign UConn, helping the school exceed its $300 million goal by $171 million. Nayden and his wife also were generous supporters of his fellow GE alum, Stefanowski. Both made the maximum direct contributions of $7,000 to Stefanowski’s campaign, with $3,500 for his primary and another $3,500 for his general-election. Nayden was an early backer of Protect Freedom Political Action Committee, giving it $100,000. Super PACs can accept unlimited contributions. He and his wife also gave $10,000 each to the Connecticut Republican Party after Stefanowski won the GOP primary.